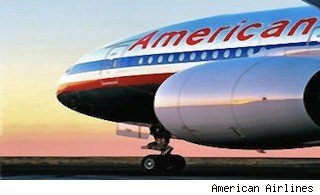 American Airlines parent company AMR Corp. today announced its fourth-quarter net loss was $97 million. The loss was significant, but the overall year-end results were better than expected for American Airlines. Last year, the airline reporter a loss of $344 million, or $1.03 per share. Reuters is reporting that AMR shares rose as much as 2.5 percent on the New York Stock Exchange early on Wednesday while Delta Air Lines posted a lower-than-expected quarterly profit, which raises concerns about whether or not the industry is stable from rising jet fuel prices. Still, AMR is reporting improvements in passenger traffic thanks to ticket prices and new routes, the company said. AMR also said today it ordered two Boeing Co. 777-300ER wide-body jets to support American's international expansion. The planes will be delivered in late 2012.